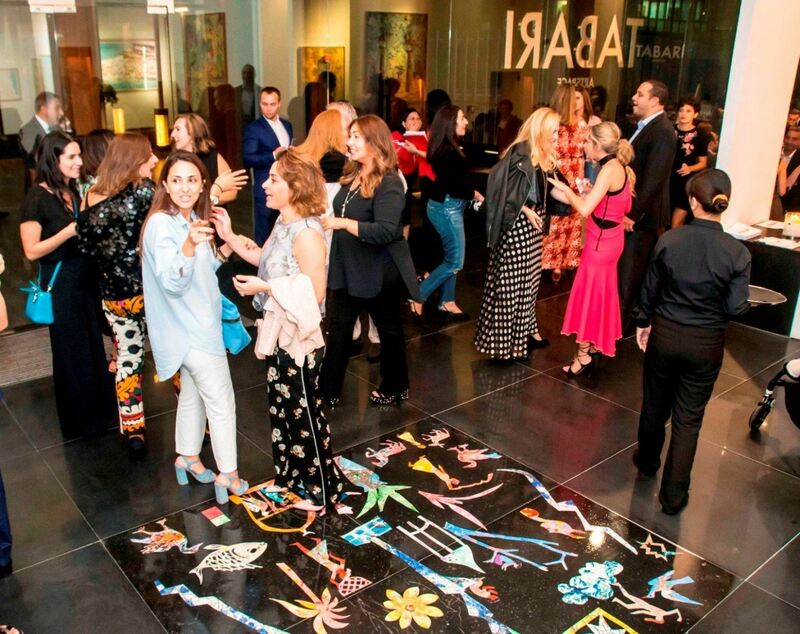 Mohamed Abla explains one of his paintings to the audienceTabari Artspace is pleased to announce the new name and visual identity of their gallery formerly known as ARTSPACE Dubai. 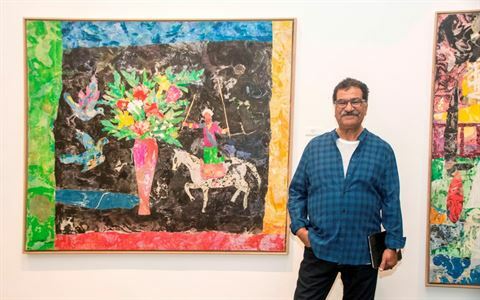 A solo exhibition of new works by one of Egypt’s most influential and established contemporary artists, Mohamed Abla will be the first at the gallery under its new name. Attendees at the opening of Tabari ArtspaceNarratives play an important role in Abla’s work, and the inspiration for this series stems from the artist‘s research into the history of the Silk Road, as well as recent travels to India, Syria and Iraq. In his works, the artist selects specific folktales which he sees as symbolic of the unsettling political and economic issues in Egypt following the Revolution in 2011. 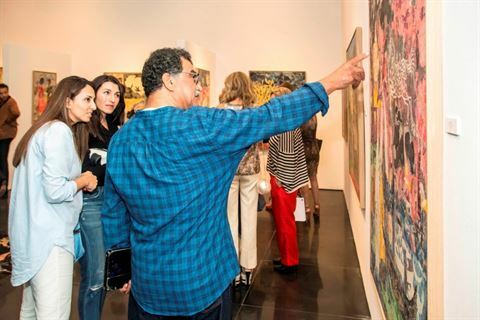 Abla reimagines the activity of the Silk Road through his artwork and draws parallels between past and present politics of the East and West. In another work, The Copper City, Abla chose a Pakistani fairy tale as a point of departure. In the story, all of the inhabitants of a city have been turned into copper except for the princess who is locked in a tower. In a conclusion similar to that of the German fairy tale Rapunzel, a hero rides through the frozen city and saves her. This fable symbolises political and social unrest in many of the countries within the Silk Road network, which paralyse government efforts to address wider problems within their countries. 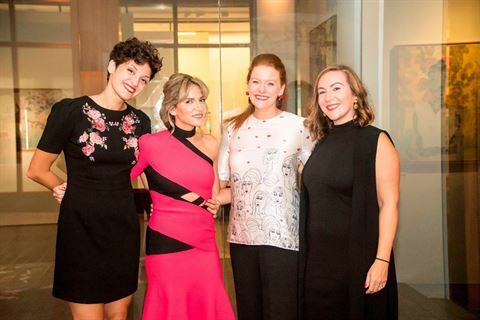 Tabari Artspace staff at the opening of the exhibitionTabari Artspace, formerly Artspace Dubai, has been a pioneer in establishing a contemporary art scene in Dubai since it was founded in 2003 by collector and art consultant, Maliha Tabari. A strong passion for the arts led Maliha to become an expert in contemporary art in the Middle East, building her own personal collection and advising on the establishment of others. 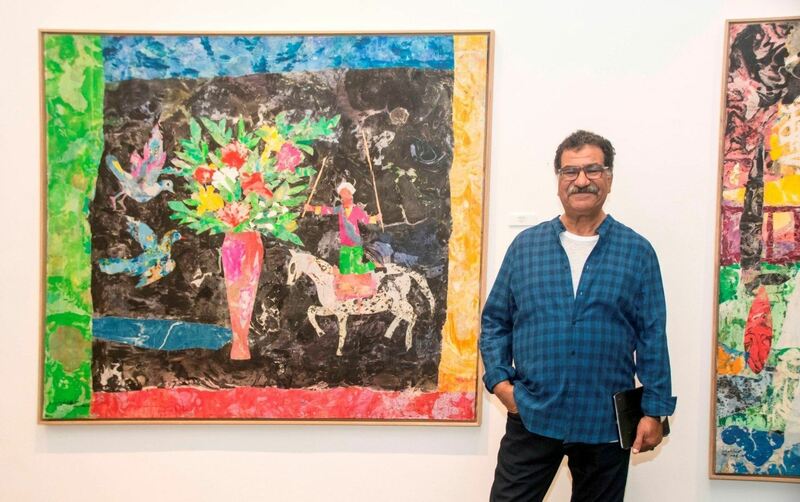 Mohammed Abla in front of one of his paintings in the first exhibition of the opening of Tabari ArtspaceBorn on 1953 Mansoura, Egypt, Mohamed Abla lives and works between Cairo and Fayoum, Egypt and Walsrode, Germany.